We’ve all been there. Standing with a spoon and a half-empty jar of peanut butter and wondering how we downed 1,000 calories worth without blinking. Ah, yes. It happens to the best of us. But did you ever wonder why you’re craving peanut butter and can’t stop giving in? If you think food addiction and lack of willpower are the problem, then read on. Chances are, your cravings for peanut butter are trying to tell you something else. 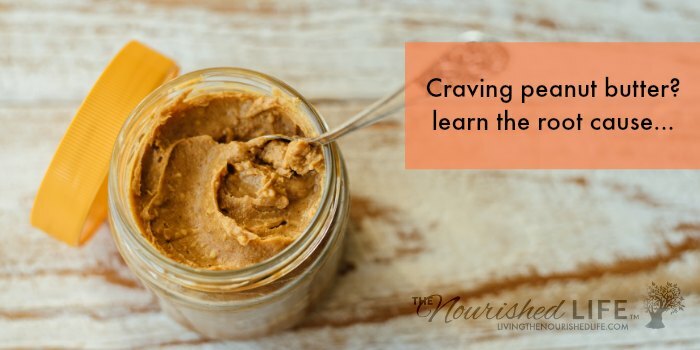 While there’s evidence that cravings can be based in our minds, there are also physical reasons we can crave certain foods like peanut butter. So don’t just assume it’s all in your head. Make sure you’re addressing both the mind and the body when dealing with cravings. Reason #1: You’re eating a low-fat diet. When fat is evil, suddenly peanut butter tastes good on everything. Rice cakes that taste like styrofoam come to life with a spoonful (or three) of peanut butter on top. That’s often your body’s signal that it needs more quality fats. Peanut butter is usually the easiest and seemingly benign choice, but the solution lies in solving the root cause. Remember, the latest research says in our minds (and really there is no enemy here — that kind of thinking only leads to the path of food obsession). Reason #2: You’re eating a low-carb diet. Like a low-fat diet, peanut butter cravings seem to common in the low-carb world as well. There is only one time in my life when I couldn’t stop eating peanut butter: when I was on a low-carb diet. Why? Because the fewer carbs I ate, the sweeter and more “carb-y” peanut butter tasted. It was on the “allowed” list, so I ended up eating a lot of it to suppress my carbohydrate cravings. I’ve noticed (at least for me) any dietary imbalance–like not enough fat or not enough carbs–triggers weird cravings. What happened when I started eating carbs again? I stopped craving peanut butter! Reason #3: You’re under a lot of stress. “Stress” can mean a lot of things. It’s basically anything that causes your body to release stress hormones (like cortisol). That means traffic jams, an argument with your spouse, or a looming deadline are all stresses–but is not sleeping enough, constant anxiety about eating “healthy” food, hating your body, etc. Dieting itself has been shown to raise cortisol levels (aka diets=stress). Our bodies tend to crave fatty, high calorie foods when we’re stressed (especially when that stress is due to energy deprivation from excessive dieting or exercise). Research has shown this to be the case. Peanut butter actually contains a specific compound that fights the effects of stress: beta-sitosterol. back into balance with other hormones (as well as reduce inflammation and improve immunity). 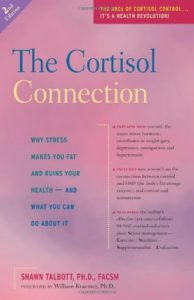 This is discussed in the book The Cortisol Connection by Dr. Shawn Talbott. How much beta-sitosterol is helpful? This might explain why someone under a lot of stress (from diet or lifestyle) might eat several tablespoons of peanut butter in five minutes flat. Could it be our bodies trying to tell us something? No. Your cravings are evil. Ignore them, feel ashamed, and eat whatever your current diet plan tells you to eat (even if you hate it). If you’ve read my post on 7 “Healthy” Habits that Stress Your Metabolism (or my books The Nourished Metabolism or Love Your Body) then you know I strongly believe that listening to your body is the best way to learn what it needs to thrive. But listening to your body doesn’t always mean eating everything you crave without putting any more thought into it. Sometimes it means tuning into the deeper meaning behind the cravings. This doesn’t mean you can’t eat what you crave. Add some coconut oil to your peanut butter, in a 1:1 ratio (I don’t know what it is, but coconut oil and peanut butter pair together really well). This is a great way to quell a craving, while also addressing the root issue. Add a little more healthy fat to your diet. Drizzle the pasta with olive oil. Butter the toast. Put some cheese on the veggies. Add some coconut oil to soups or sauces. You don’t have to go crazy and swallow two sticks of butter for breakfast–take it easy, add a little at a time, and figure out the right amount of fat for your body. Just eat some peanut butter. For real. You don’t need to deal with a harrowing battle of cravings vs. willpower (which does nothing but add to your stress levels). However, if you think your cravings for peanut butter are the result of high stress levels, try to do something quick and easy to counter your stress after having a nice, creamy spoonful of peanut butter. Take 30 minutes to listen to your favorite music or relax in a hot bath. If your stress is due to over exercising, then try toning down your workout for a day or two (take a relaxing walk outside instead). Have a balanced snack if you’ve been skipping meals. Exhausted? Take a power nap or try to hit the sack an hour earlier tonight. Get a little more sunshine. Eat more balanced meals and snacks (with enough energy and nutrients to support your body and its daily activities). Get at least 7-8 hours of sleep most nights. If you can’t do this every day, try to make up for it by taking a nap or sleeping in a couple times a week. Move your body a little more if you tend to be sedentary, or a little less if you tend to overdo it to the point of exhaustion. Make time to do the little things in life, like laugh at your own jokes, watch a few more sunsets, feel the grass under your bare toes (all work and no play doesn’t just make Jack feel dull–it will do it to anyone!). Do some yoga (science says it). The point of all this is that you don’t have to freak out over cravings. Cravings aren’t actually the little devil on your shoulder trying to make you give in to temptation. Sometimes they’re just a little nudge from your body trying to tell you something. Don’t be afraid to listen. You can also read more about how I learned to eat and exercise in a way that nourished my metabolism (without stressing about it!) in my book The Nourished Metabolism. No gimmicks or magic pills, just a balanced perspective on how you can improve your metabolic health with simple changes to your diet and lifestyle. Click here to check it out. Thanks for the awesome post….sharing all over the place! Ps I’d love to get you the flavor when it launches! I love this post… and I am one of those who can eat and enjoy peanuts and peanut butter…. I am curious though, since i have a couple of family members who are quite allergic to peanuts… what other plants out there give us that badly needed Beta-sitosterol? Thanks for this! Avocados and pumpkin seeds also contain beta-sitosterol. Thank you for listing other foods with beta-sitosterol! Because I too crave peanut butter and eat only the organic kind with no salt or sugar or palm oil. BUT peanuts have mold, and I was recently exposed to black mold and have to stay away from all mold in food and environment best I can. ALWAYS discard the oil off the peanut butter jar. It is highly toxic. Peanut oil is never good. But even still, peanuts have mold, and are NOT the best choice to get the nutrients we are speaking of here. Avocados are by far the best choice, with just a 2/3 cup giving you 76 mg of beta-sitoterols. Second choice is almonds or almond butter, pistachios, pecans or walnuts in the nut category. Dark chocolate 72% or more is a far better choice as well for numerous reasons to our health. Still not ready to claim peanut butter, even organic, is a great, great option. Great post! I used to eat a lot more peanut butter out of convenience too. I used to crave it when I was first nursing and my supply was still getting established. Maybe the extra fat that my body needed. I’m still nursing, but I’m not eating as much peanut butter these days. Must be getting enough fat from eggs and coconut oil (yum!) Thanks again for the insight. Interesting post! When I was 19 I joined the AF and during basic training I ate really poorly because the food was so different than what I was used to in Hawaii. That and the fact that there was a bizarre rule that as soon as one person at your table was done eating, everyone was done whether you just sat down or not. When I got to my tech school I was obsessed with peanut butter and peanuts. I didn’t stop until I gained 30 pounds in a month! I’ve always remembered that because I’ve never been addicted to a food like that before and I always wondered why. That’s really interesting. My husband had a similar experience in basic training–he looked like he was starving when he got out! It’s amazing what the body will do to compensate for a huge energy deficit like that. 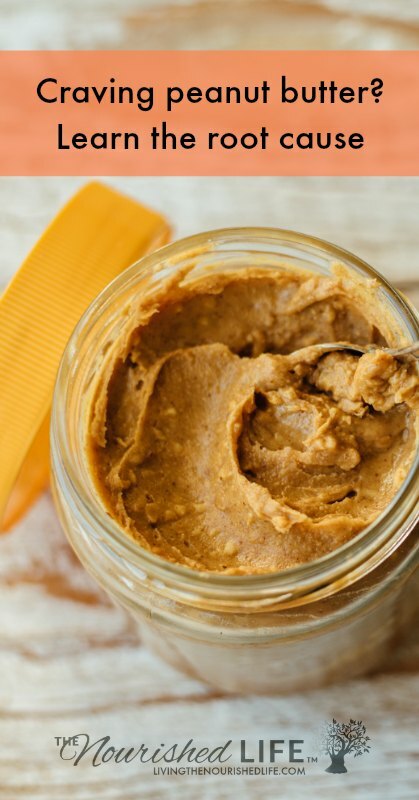 cravings for peanut butter can be a result of a lack of essential fats, which you mentioned. However, peanut butter is actually not healthy. The peanuts are roasted, which changes the molecular structure of the fat. Also, peanuts are legumes and are very hard to digest, especially today. Most people have poor digestion and do not make enough stomach acid. Lastly, peanuts are very high in arginine, which depresses the immune system. Lastly, some people need to eat low carb if they have auto-immune disease. To say that humans need starch and sugar when they actually need vegetables is a little misguided. Ketosis is completely healthy and necessary for people with compromised immunity. Thanks for your comment, Melissa. I agree, some people do better with peanut butter than others. I think it’s good to follow your cravings, but also to figure out the deeper reasons behind them so your body gets what it really needs. On low-carb, I’ll agree to disagree–but regardless of my opinion, I firmly believe that a person should listen to their body and do what they feel is best for their health and well being. How about craving peanut butter because you’re actually allergic too it…and you don’t know it yet? YA- that just happened to me this week. Have you heard of this? Sorry to hear about that! Hopefully your reaction wasn’t too severe. I’ve heard of this happening, so it’s something to watch out for, but if someone has eaten peanut butter without a reaction before they should be fine. I’ve never been a big peanut butter fan, but ever since I started my dieting and exercising I’ve been craving it like crazy. Now it all makes sense. Thanks! It’s crazy, isn’t it? I rarely crave peanut butter, so when I do it always makes me think about the *why* behind the craving. Just a quick note to let you know that we shared your “story” today on our “Healthy Living Arkansas” FaceBook wall…thank you for sharing it. Thank you Raquel!! I appreciate the share. I think it could also be that we aren’t getting enough protein. The price of meat and dairy have skyrocketed to the point we survive on pasta, sandwiches, and vegetables. Once, maybe twice a week do we have any meat – chicken, turkey, beef. I have been craving PB intensely for the last couple weeks – as in eating 2-3 heaping soup spoons full every day, in addition to my daily PB&J sandwich. Good point! Sometimes it can be hard to get enough protein. We rely on dairy and eggs here if meat isn’t in the budget. I also get INSANE cravings for peanut butter. Literally subbing most of my meals for PB for around 6 months straight until it just stops without me even noticing. Then one day, a friend will be eating some PB and i’ll try some and then I’m hooked for another 6 months. I truly feel that it’s acting more like a DRUG instead of my body telling me I’m lacking something. This happens only with peanuts and it makes me think about how many people are allergic to peanuts and can die just from a whiff. I’m sure there’s a connection. Also, peanuts are high in a mould called alfatoxins so it could be something to do with this. Finally found justification after finishing a jar of pb in 3 weeks! Before reading your article I always thought this terrible crave is due to my diet, which made no sense because I’ve been pretty generous about using fat in cooking, and there’s plenty of carbs to go with it. Now the stress factor is hitting me hard! I’m glad that I looked it up, and found your article =) Time for more peanut butter and a good change! I just joined your newsletter and this is the first post I read. Great post – it makes so much sense. I just have one problem – I was diagnosed with a peanut sensitivity when my homeopath did a BEST allergy test on me. I do get peanut and peanut butter cravings. Is there another nut that I can substitute that will have the same effect for fat-levels and stress? Looking forward to reading lots more of your posts. Thanks for sharing and for your common-sense approach. Elizabeth, check out Laura’s comments — she made some great suggestions for alternatives.